Claudio Corti is about to embark on his first season in MotoGP. 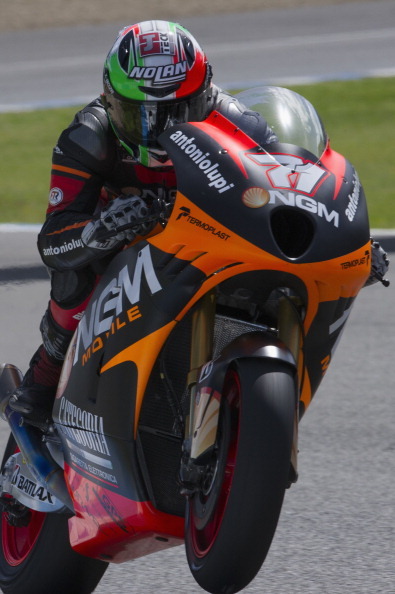 NGM Forward Racing won the first CRT battle in Qatar last season, and this year the team is expanding again, by fielding a second rider. That second rider is Italian Claudio Corti. Corti has been in Moto2 for the past three season, and now has his chance to excel in the premier class, alongside the vastly experienced Colin Edwards. The Italian is heading into the 2013 season full of optimism, and when GPxtra caught up with Corti after the final test we asked how things are going as he prepares for his debut MotoGP season. – Firstly, how does the bike feel after the tests? It feels a lot better, we have had very little time to work on the chassis of the bike. But in terms of the electronics the development has greatly improved, making the bike easier to ride, and less dangerous. – You’re about to embark on your first full season of being in MotoGP, how does it feel? I am still realizing it. I use to dream about becoming a MotoGP rider when I was a little boy, so it has taken some time for me to process it! – And what have you found the biggest difference from the step up from Moto2? You cannot calculate the differences between MotoGP and Moto2, they are two completely different things. It’s like day and night, starting from the tyres all the way up to the engines. – Are the Bridgestone tyres and carbon brakes as hard to adjust to as we get told about? In terms of the brakes they brake a lot better that your usual brakes and there was no need to getting use to them. The tyres on the other hand, I have not yet gotten use to them. I don’t think I have been able to take full advantage of them. I will need to do many more kilometres to understand how far I can push with them. – You had the race in Valencia on the Inmotec, how different is the FTR bike you’ve got now? They are two completely different bikes , the Inmotec has a carbon chassis and it just started developing while the FTR was clearly ahead in terms of its development. – Does having somebody with the experience of Colin next to you help you? It helps a lot, especially when we have to talk about the electronics. He has a lot more experience than me and can guide the team, he has a more clear understanding of it. – What are you hoping to achieve this season? Make our FTRs get to the same level as the ARTs. – What would be a success in your eyes for 2013?